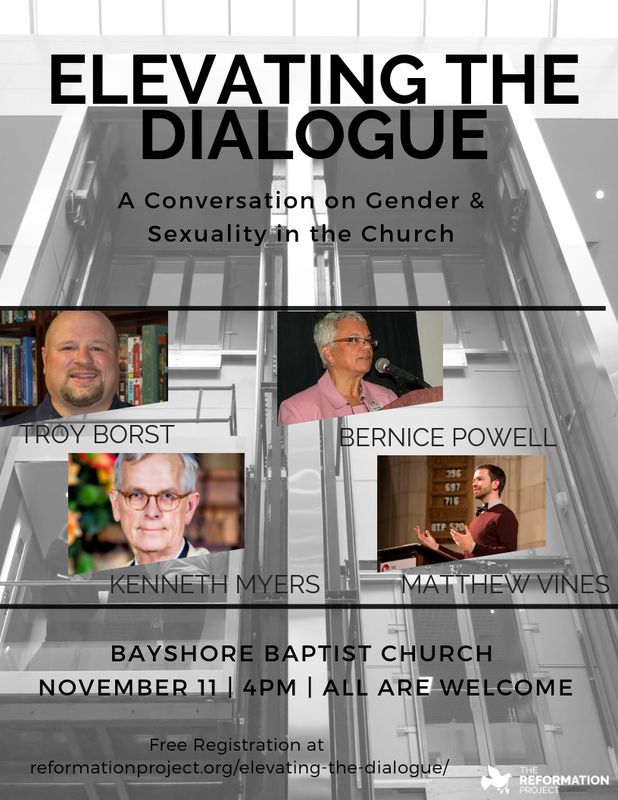 Bayshore Baptist Church will host a public conversation with The Reformation Project on how churches can be more inclusive and supportive of LGBTQ people in and around Tampa. This is a free event and all are welcome, whether you've been a Christian your whole life or haven't set foot in a church in years. Join us and bring a friend as we engage this vital conversation. It's time to elevate the dialogue on LGBTQ inclusion in the church. This forum will feature Kenneth J. Meyers, Faith Formation Specialist at the Alliance of Baptists; Rev. Dr. Bernice Powell Jackson of First United Church of Tampa; and Dr. Troy Borst, pastor and professor at Johnson University. Matthew Vines, The Reformation Project's Executive Director, will moderate the conversation.